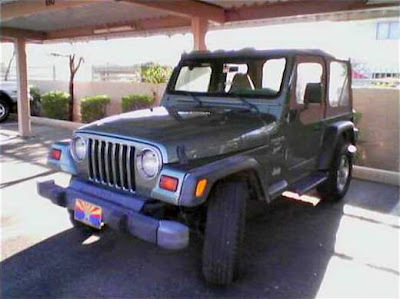 On August 29, 2005 I rolled this Jeep Wrangler over three times across several lanes of highway between Tucson and Phoenix at high speed. Lesson learned. 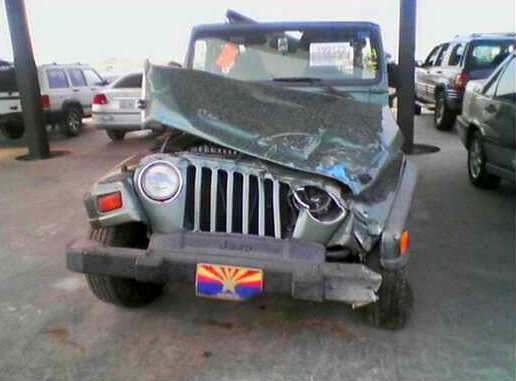 This is what the Jeep looked like at the salvage yard where it had been towed. 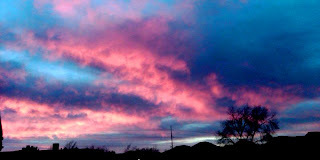 If I ever had any doubt that there is not some shroud of protection around me, this was another reminder of several I've had in my life, that there is a Higher Power watching over me. This occurred midday as I was driving back from Tucson to Phoenix travelling in the left lane at the speed limit, 75 mph. I reached to the console to get my drink and slightly tilted the steering wheel to the left and the road pavement had a significant drop off onto the median. This is an area where the natural landscape is hard desert pavement. 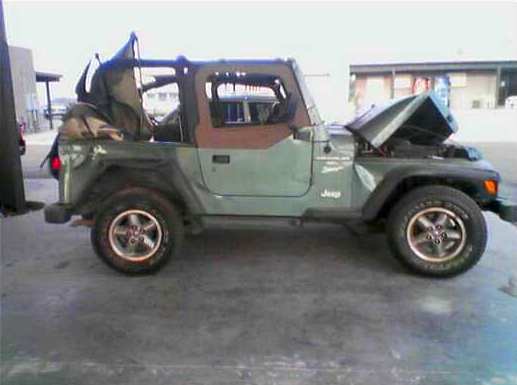 At that point I lost consciousness but I later learned I had over-corrected and flipped the Jeep over to the right three times across lanes of traffic with cars following behind me in all lanes. All I remember is coming to, strapped in with my seat belt, hanging half sideways and hearing voices and commotion outside. Now fully conscious, I was unable to free myself since most of my weight was strapped in by the seat belt and it wouldn't unlatch. I don't recall exactly how I did get out but I do remember a lot of discussion going on outside about whether I should move or not and whether people should stick around because "gas is spilling everywhere and this thing is gonna blow to kingdom come." Somehow I got out and by this time the Gila River Indian Paramedics and the Arizona Highway Patrol had arrived. I was on the median, laying flat on my back, the paramedic asking me questions and I was answering everything affirmatively. The question that struck me as I was laying staring up in the bright sky and glaring sun was "Why are there helicopters buzzing around above me in the middle of nowhere?" They were air evac helicopters and I determined I was having none of that and said so. Fortunately neither was the very proficient and excellent paramedic who assessed that I was amazingly relatively unharmed. I still needed to be transported to a trauma center, miles away in Phoenix, to be checked since I wasn't exactly unscathed. This was amazing because the eye witnesses, including the preacher who had been following me and stayed with me, described the incident as being spectacularly scary and dramatic to watch. Not quite so comforting were the people who were clucking they were surprised I "wasn't dead." 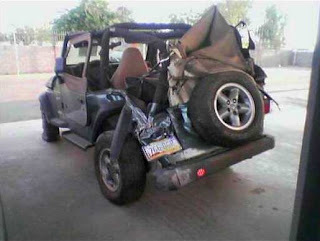 In the end I was transported by ground in a rather long, freeway traffic stopping trip to a trauma center in Phoenix. I was treated for a concussion and slight head injury and basically banged up and sent home every early the next morning. Now, that was truly amazing. I came across these pictures and it made me think about how that incident was the beginning of my making significant changes in my life. There is much more to what actually happened but there are a lot of wrecks on the highway and lots of people who will tell you in explicit detail everything that happened. What is important is what we learn and usually it isn't in the form of an "Ah Ha!" moment immediately after. Truthfully it is only now, nearly five years after, that in hindsight I see the positive impact it had on my life. I believe because at the time I was aware enough to know that I had escaped a very close call and open to learning from it that lessons came in their time. It would make the story more dramatic if I said that I immediately made big changes in my life but that would be untrue. I have progressed a long way and I do believe this incident had a lot to do with my development to a better understanding and maturity but it was in a series of steps and small leaps. Life is more often like that. To make this more intriguing, this is the third time I have had close calls with death. It is an indication to me that there is a reason I'm still here. To that point, I will defer to "we see through the glass darkly" and that some day I will know in full as I have been fully known.